Ok, so yeah, Tony and I got married 7 1/2 years ago, and I finally just got around to doing a layout about our amazing wedding party. What can I say, the last 7 years have been busy! ;-) The truth is, I don't do nearly as many event/holiday layouts as I do "everyday" type layouts, so our poor wedding has been very neglected. I'm sure when the kids are in college i'll get it all done! Journaling reads: Thankful for the amazing friends and family who stood by our side on such an important day. They helped to make our day even more special! 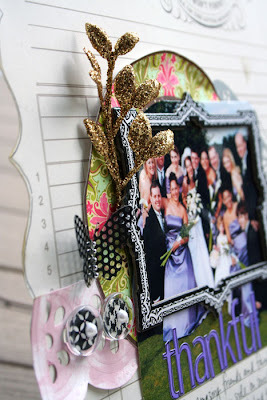 I had fun playing around with lots of stuff in my stash that i'd been hoarding - Creative Imaginations papers, Making Memories frame, acrylic circles and gold leaves, and Heidi Swapp butterfly. In other scrappy news, i'm eagerly awaiting the new soon-to-be-released-at-CHA Fancy Pants stuff! Can't wait to dig in and create! I also still can't believe that i'm actually going to CHA, and that it will be here in less than 3 weeks, wow! I'm so excited not only to attend the show, but also to meet so many people that i've come to know in the scrappy world over the last few years!! Anyway, hope you all are having a wonderful week! It's been an eventful one here, and i'm ready for the weekend to relax! Girl your creativity is just amazing with paper .. you inspire .. congrats on your marriage .. so glad to see you with Fancy Pants still .. I remember that is how I found you as an official stalker LOL .. during that particular call ..
Gorgeous layout. I always love seeing your wedding photos! What a beautiful LO - I love the Fancy Pants stuff too! Have a great trip to CHA! Really beautiful!! I love pulling out the 'old' stuff now and then. :) Have fun at CHA!! Love this one....wow it is amazing...love all the dimension and layering!!!! What a fun group pic here ! love the little details . What a beautyful lay out! Yet another gorgeous page from you, Staci! Looked like you had one fabulous wedding day! How cool that you are going to CHA this year! I'm jealous that you get to meet so many fun on-line friends! Enjoy... and take pix to share! last 7 years have been busy! --->> I like this! LOL... the wedding LO is gorgeous Staci! I haven;t scrapped mine and it's over 10 years ago! LOL. ooooh! love the mix of textures and colors. LOVE the dimension my friend! ANd yay for scrapping a wedding layout. Don't feel bad - i was married 13 years ago and have never scrapped any of it!! oh so beautiful!!! love love it Staci!! I love the big butterfly and the neat way you framed the photo. Cool to highlight part of the photo that way. Lovely! I need to scrap some more of my own wedding pics...it's been 15 years for us and I still haven't done too much with ours! Great inspiration girl! TFS!